A sure sign of the holidays is that creamy, delicious mixture known as eggnog. Yumbo. I had some around my house and as satisfying as it is to drink straight up I thought I would use it to make this delicious cake recipe so it would last even longer and I could share it with even more friends. 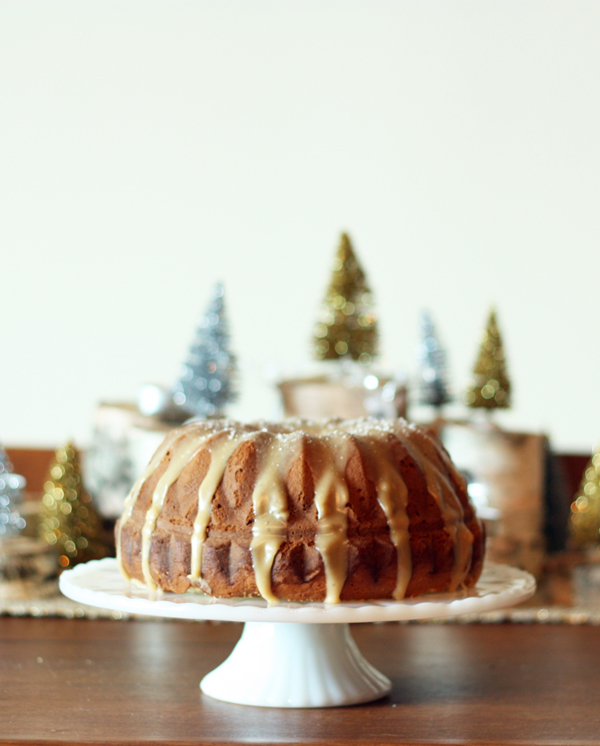 The fresh nutmeg really brings out the eggnog flavour and the salty & sweet caramel glaze just puts it over the top. 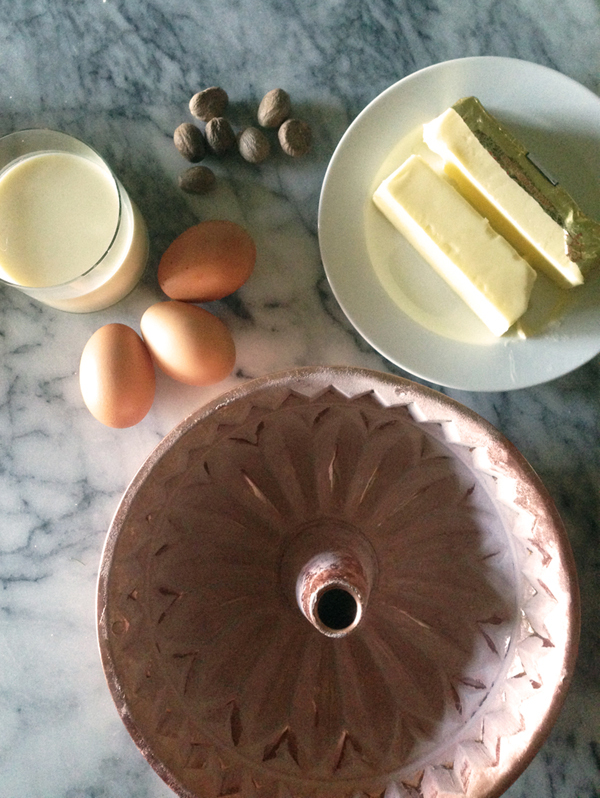 Keep reading for the recipe and ‘how to’ for this delicious treat. 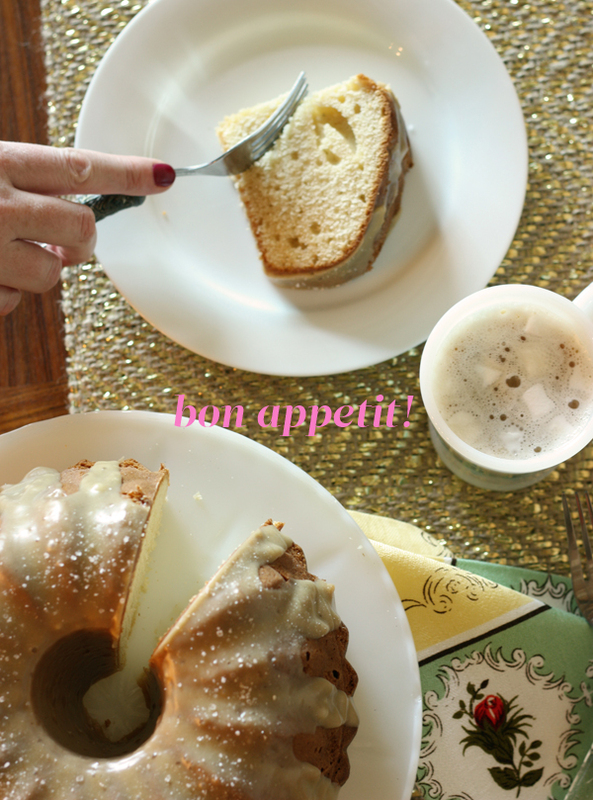 I adapted this recipe from this one for mini-bundt cakes. 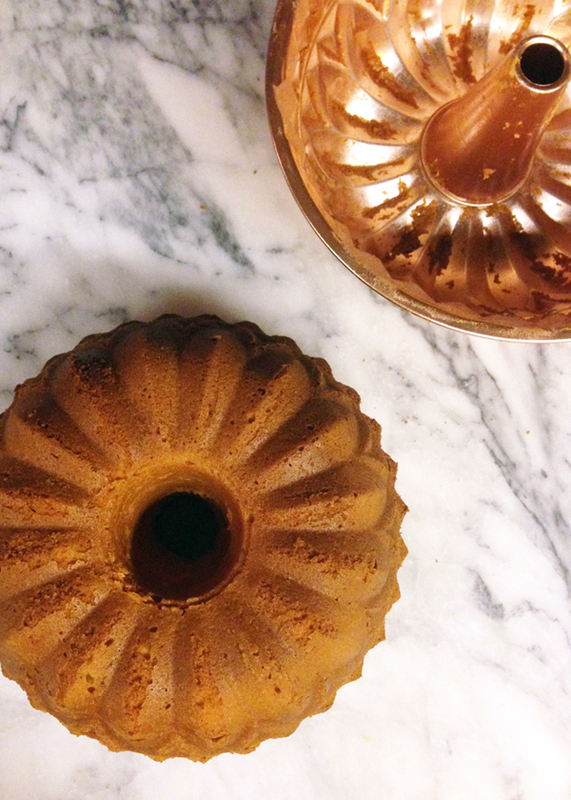 I had this beautiful copper bundt cake pan that I was dying to use and decided to do one big cake instead of a bunch of minis. 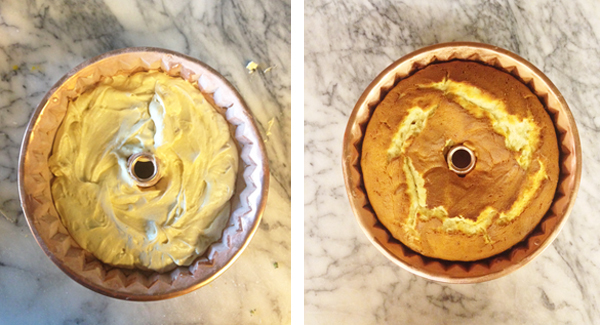 Preheat the oven to 375 degrees F. Butter and flour a bundt pan and set aside. 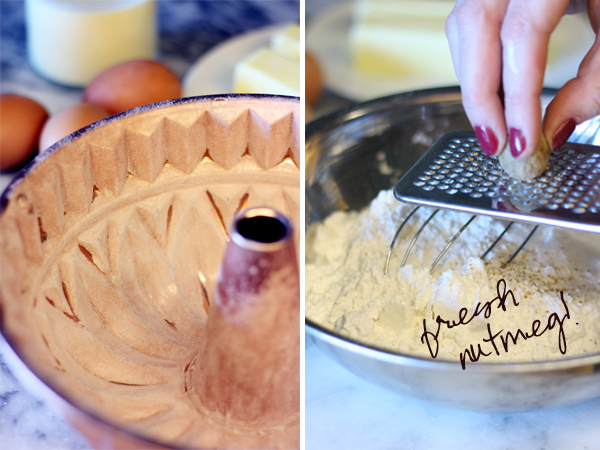 In a medium bowl, whisk together the flour, baking powder, salt and nutmeg. In a large bowl with a stand mixer (or handheld electric mixer), beat the butter until creamy, about 30 seconds. Add the sugar and beat until light and fluffy. Add the eggs one at a time, mixing after each addition. Combine the eggnog and vanilla in a measuring cup and add to mixture. Add the dry ingredients to the butter/sugar mixture. Mix well then spoon the batter into cake pan. Bake for 60 minutes, or until a skewer comes out clean (may need more time depending on your mixture & oven). Keep an eye on this and adjust for your oven. 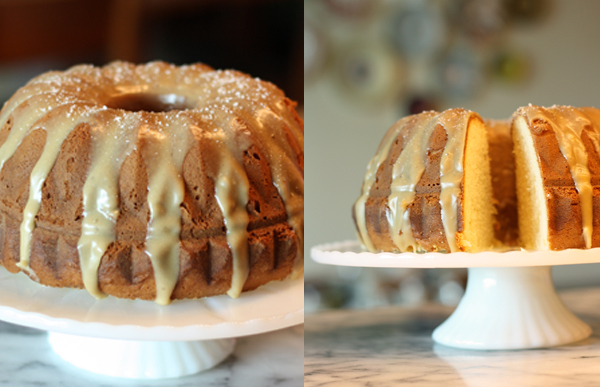 Because this was originally for mini bundt cakes I had to adjust the timing for one big cake. Let the cake cool then turn upside down and release from pan. You’ll end up with this beautifully designed edible work of art. 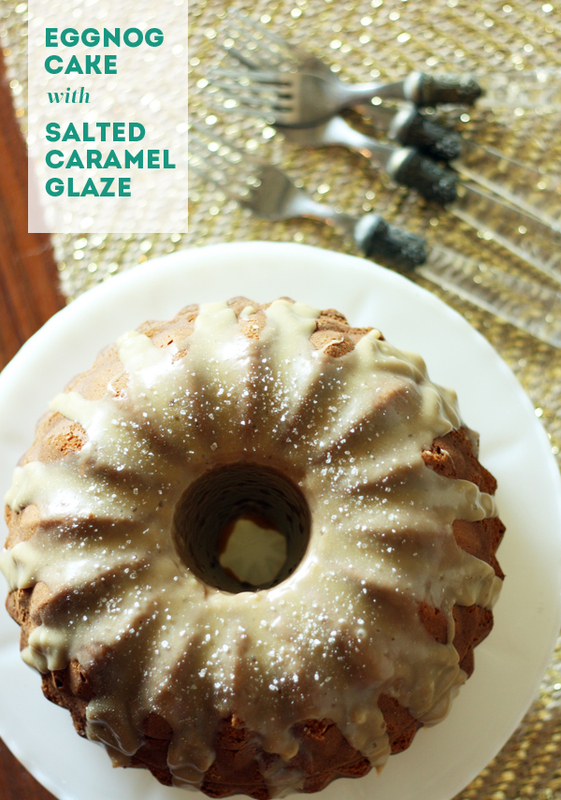 As if it doesn’t already look delicious enough, now comes the part that puts it over the top – the salty caramel glaze. Combine the butter, brown sugar and heavy cream in a small sauce pan. Bring to a boil over medium heat, stirring constantly. Remove from the heat and transfer to a bowl. Let cool slightly. Add the sea salt and beat for 1-2 minutes. Add 3/4 cup confectioners sugar and beat until no lumps remain. Add more sugar if you think the glaze is too thin. 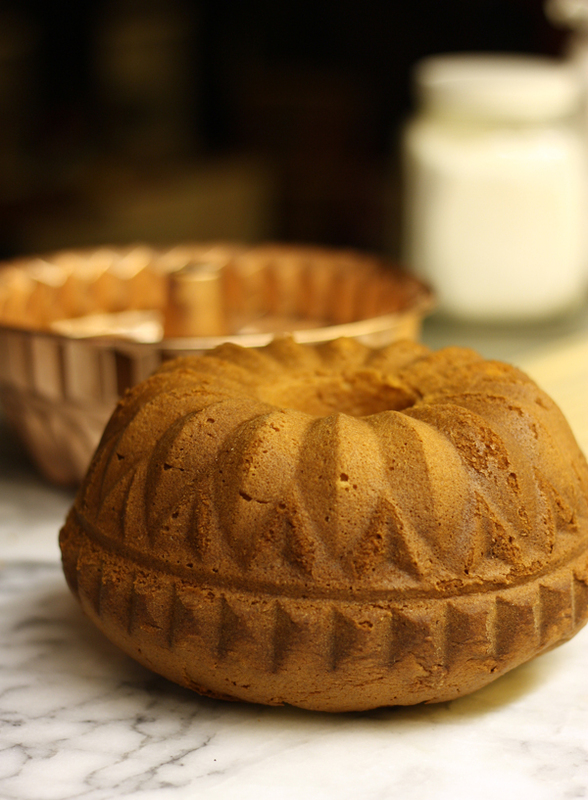 Place the bundt cake on a parchment covered baking sheet or platter. Spoon that delicious goodness over the top of the cake. I gathered up the drippings and re-poured them over the top. No sense to waste! Although it will be VERY hard to refrain from sneaking a lick of this salty-sweet-too-good-to-be-true-butter-and-sugar liquid crack* (*not really crack). For the final touch, add a small sprinkle of sea salt over the top of the cake just before serving. This cake is just dying to be paired with some amazing vanilla ice-cream which I didn’t happen to have but I highly recommend when serving to guests. If you can find eggnog ice-cream that would be amazing. If you like this delicious recipe, you can find more good eats here.